The weak El Niño of 2014 was preceded by anomalously high equatorial Pacific Warm Water Volume (WWV) and strong Westerly Wind Events (WWEs), which typically lead to record breaking El Nino, like in 1997 and 2015. Here, we use the CNRM–CM5 coupled model to investigate the causes for the stalled El Niño in 2014 and the necessary conditions for extreme El Niños. This model is ideally suited to study this problem because it simulates all the processes thought to be critical for the onset and development of El Niño. It captures El Niño preconditioning by WWV, the WWEs characteristics and their deterministic behaviour in response to warm pool displacements. Our main finding is, that despite their deterministic control, WWEs display a sufficiently strong stochastic component to explain the distinct evolutions of El Niño in 2014 and 2015. A 100-member ensemble simulation initialized with early-spring equatorial conditions analogous to those observed in 2014 and 2015 demonstrates that early-year elevated WWV and strong WWEs preclude the occurrence of a La Niña but lead to El Niños that span the weak (with few WWEs) to extreme (with many WWEs) range. Sensitivity experiments confirm that numerous/strong WWEs shift the El Niño distribution toward larger amplitudes, with a particular emphasis on summer/fall WWEs occurrence which result in a five-fold increase of the odds for an extreme El Niño. A long simulation further demonstrates that sustained WWEs throughout the year and anomalously high WWV are necessary conditions for extreme El Niño to develop. In contrast, we find no systematic influence of easterly wind events (EWEs) on the El Niño amplitude in our model. Our results demonstrate that the weak amplitude of El Niño in 2014 can be explained by WWEs stochastic variations without invoking EWEs or remote influences from outside the tropical Pacific and therefore its peak amplitude was inherently unpredictable at long lead-time. This paper is a contribution to the special collection on ENSO Diversity. 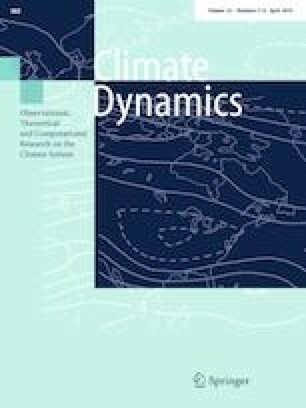 The special collection aims at improving understanding of the origin, evolution, and impacts of ENSO events that differ in amplitude and spatial patterns, in both observational and modeling contexts, and in the current as well as future climate scenarios. This special collection is coordinated by Antonietta Capotondi, Eric Guilyardi, Ben Kirtman and Sang-Wook Yeh. JV and ML acknowledge funding by Institut de Recherche pour le Développement (IRD). EG acknowledges funding by the Centre National de la Recherche Scientifique (CNRS) and from the National Centre for Atmospheric Science, a UK Natural Environment Research Council collaborative centre. This work was co-funded by a French Ministère de l’Education Nationale et de la Recherche grant, by a grant from the Agence Nationale de la Recherche MORDICUS, under the “Programme Environnement et Société” [Grant no. ANR-13-SENV-0002-02] and by the GOTHAM Belmont project (Grant no. ANR-15-JCLI-0004-01). This is PMEL contribution xxxx.